Tim Tebow is starting his career with the Columbia Fireflies, bringing excitement throughout the South Atlantic League. It's Tebow time in the South Atlantic League. 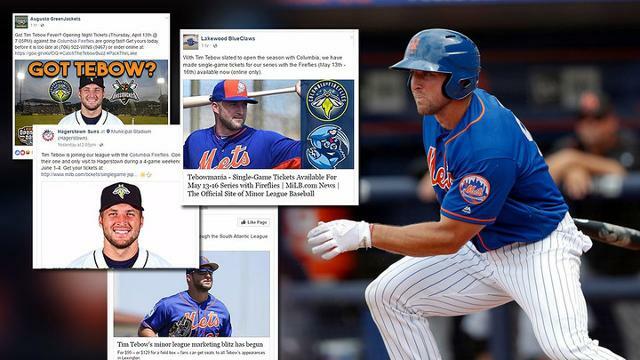 The New York Mets announced Monday that Tim Tebow will begin his professional baseball career with their Class A affiliate, the Columbia Fireflies. Tebow is not a typical Minor Leaguer, of course, as typical Minor Leaguers aren't 29-year-old evangelical Heisman Trophy-winning quarterbacks with NFL experience and an international following. This is a man who has cultivated a massive, devout fan base, as well as a contingent of seemingly ever-present detractors. In short, everything Tim Tebow does is news. And now the Fireflies -- and the entirety of the South Atlantic League -- are a big part of the story. Tebow will be the most high-profile Minor Leaguer since 1994, when Michael Jordan (temporarily) retired from the NBA, signed with the White Sox and spent the season with the Double-A Birmingham Barons. John Katz was among the sprawling cast of characters during Jordan's memorable run through the Southern League; in 1994 he served as media relations coordinator for the circuit's Carolina Mudcats franchise. Now, as Columbia Fireflies president, he's playing a direct role in facilitating Tebow's Minor League experience. "It's been a whirlwind," said Katz, speaking in Columbia shortly after returning from a trip to the Mets' Spring Training home of Port St. Lucie, Florida. "To the extent that we've been able to prepare for it, we've prepared for it. I spent time with Timmy [Wednesday] morning. The guy gets it -- he knows he's nine or 10 years behind other kids. But you look at the smile on his face, you know he wants to be here, and from that standpoint it's exciting…. I hate to sound cliché, but it's a blessing for us to be a part of it." Tebow's presence will certainly be a blessing at the gate. The Fireflies have recently experienced what Katz, perhaps understatedly, refers to as a "noticeable uptick" in ticket sales. There has also been a noticeable uptick in the sale of Fireflies merchandise, whose apparel line now includes Tebow T-shirts. "The impressions globally have been phenomenal," said Katz. The Fireflies open their season at home on April 6, kicking off their second year at Spirit Communications Park after relocating from Savannah, Georgia. Savannah's Grayson Stadium, the Mets' previous Class A locale and Katz's former place of employment, opened in 1926 and would have been a logistical nightmare in terms of handling the crush of fans and media that Tebow will bring. "One of the byproducts of moving into a new park is the amount of people [on staff] that we have," said Katz. "Community relations. Social media. I feel like now, more than any time in my career, we're best equipped to handle something like this. We have the right people to make the experience great. We can let Timmy be a ballplayer, to go through the process and hopefully make his way to the big leagues. And to do that while understanding that there are 24 other guys [on the Fireflies roster] going through the same thing. Understanding that balance is going to be important." Tebow on Tour: Coming to a ballpark near you? Making a Minor League schedule is never easy, but it's particularly difficult in the Sally League. The circuit stretches as far north as Lakewood, New Jersey, and as far south as Charleston, South Carolina. Only one team -- the Greensboro Grasshoppers -- is located less than 500 miles from all the other teams. (This is an important number in Minor League Baseball as teams are prohibited from traveling more than 500 miles by bus at a single stretch.) The ramifications of the SAL's sprawling footprint are evident in its schedule, which is created via supercomputer by a team of Johns Hopkins University researchers and students. Variables such as the even distribution of weekend home dates are given higher priority than every team playing at least one home and away series against each other. All of this is to say, three teams -- the West Virginia Power, Asheville Tourists and Greensboro Grasshoppers -- won't host the Fireflies at all this season. The remaining 10 teams are now preparing for brief bursts of Tebowmania, marketing his appearance while including some variation of an essential caveat that can be paraphrased as "Hey, this is Minor League Baseball. Tebow might get promoted, demoted, injured, released or retire. But we sure hope he'll be with the team when the Fireflies come to town." After the Fireflies open at home (on MiLB.TV), they'll travel to Augusta, Georgia, for the GreenJackets' home opener. Augusta general manager Tom Denlinger said Tebow's possible appearance is "catching the CSRA [Central Savannah River Area] by storm." "Got Tebow?" reads the team's social media imagery, above a photo of the smiling erstwhile quarterback. From Augusta, the Fireflies are on to Rome, Georgia, where the Braves have taken a conservative approach and simply mentioned that "Tim Tebow is tentatively scheduled to play." The Hickory Crawdads are next up on the road trip docket, with Columbia in town from April 27-30. General manager Mark Seaman reported that tickets sales for the four-game set are "300 to 400 percent higher than usual." The Fireflies visit the Delmarva Shorebirds from May 10-12. General manager Chris Bitters said online ticket sales have been "very robust" this week, and that on May 10 Tebowmania will collide with "Mascot Mania" when a couple dozen costumed characters (give or take) visit the ballpark to celebrate Sherman the bird's 22nd birthday. Bitters added the standard disclaimer that Tebow "may or may not" be on the roster but said "fans will have a great time at the Shorebirds game regardless." From Delmarva it's on to the Lakewood BlueClaws. The team put these May 13-16 games on sale Tuesday, in advance of when they otherwise would have been made available to the public. Director of communications Greg Giombarrese said reserved seats for May 13's game -- a Bark in the Park promo in which dogs are admitted -- are nearly sold out, and that Tuesday yielded the most traffic to the team's website of any day this offseason. The Fireflies make it to Lexington on May 28, and the Legends will be ready. To "capitalize on the hysteria," the team is offering a "Ten Tebow" ticket package for all 10 games (over three series) in which the Fireflies will be in town. Legends creative director Ty Cobb (yes, that is his real name) said "the last time Tim Tebow played a game in Lexington, it was an SEC football match-up and he left the field on a cart after taking a vicious hit from a University of Kentucky defensive end. Now he'll return with a baseball bat and glove…. You never know if or when you'll ever have an opportunity even remotely close to it again." From June 1-4, Columbia will take on the Hagerstown Suns. The Suns' Facebook post promoting Tebow's potential visit became what GM Travis Painter called "our widest-reaching media post of all time, reaching over 35,000 people…. We have sold about 1,200 tickets over the four-day span." The Greenville Drive host the Fireflies from June 13-15. From there it's 213 miles south to Charleston, where RiverDogs GM Dave Echols points out that, coincidentally, the team will have a pre-game church service on June 18. Perhaps the famously religious Tebow will attend? Feldman, clicking through the team's recent online ticket orders, said 16 of the past 17 had been for one of the games in which Tebow might be in town (emphasis on "might"). Seconds later, he paused. "We just got another one," he said. "And, yeah, it's also a Tebow game."